I’m going to be a purist. I recently saw Guillermo del Toro’s “El Laberinto del Fauno” (translated badly in English “Pan’s Labyrinth”–badly because there is only one Pan, but this movie concerned one of many “fauns.” And don’t get me started on Peter Pan.) I expected a lot, not only due to the hype surrounding the film. I’ve written a novel that concerns a young girl like Ofelia: absent parents, a child who sees a ghost. Like Ofelia, she is caught in a realm that, to an outsider, might seem imaginary. As I wrote the novel, I grappled with the question of what was real. Out of respect for my protagonist, I always fell on her side–that is, I take what she sees and experiences as real. I decided that if readers needed to see her as lost in her imagination, if they needed a scrap of the rational to hang onto, fine, but as storyteller and creator, I trusted her perception. Guillermo del Toro’s film is stunning. His inventiveness and the way he realized the piece was a treat for the senses. But I was disappointed when rationality crept in at the end…bursting the “dream” of the story, to show us what “really” happened. To me, he betrayed the beauty he’d created. I’m always bothered when adults disparage imagination, when they dismiss anything other than kitchen sink-realism as escapism–as the adults in the film essentially did the same to Ofelia. I admit I sometimes feel haughty when talking to people who have dismissed fancy–quietly I cheer the fact that I still allow myself the freedom to believe in story. I want a creator to let the dream be the dream that it is; I love when a creator lets the story be “real.” And by this I don’t mean realism. This letting the dream be real can make something transcendent, much more than escapism. In fact, things seem more like escapism when a creator shoves your nose in the “real world,” as a contrast to the imaginary world. This usually comes at the end, thereby reigning in imagination, shoving its messy boundaries back into its proper box: childhood, or perhaps the asylum. I took a creative writing class in high school. Our teacher had one rule: no story could end with, “and then I woke up.” “And then I woke up” is what makes something imagined turn into escapism, the acknowledgement of the serious, the real, the rational life we busy adults must get back to, come now you foolish thing! But isn’t it better, in this nasty, brutish, and short life, isn’t it better to leave the imagination alone, let it be what it is? To let it thrive? How many inventions and dreams would not have been realized if we always have to wake up from the dream before the story is over? If we need creators to remind us that life is mundane, to pull us back from that dangerous abyss of invention. It used to make me mad when I encountered one of those “and then I woke up” moments in film or fiction, when the cold slap of reality hit my cheek. But this time, imagining that del Toro must have felt he had to let that ugly lump, rationality, back in, I just felt sad. I felt pity for him, and sad for me. 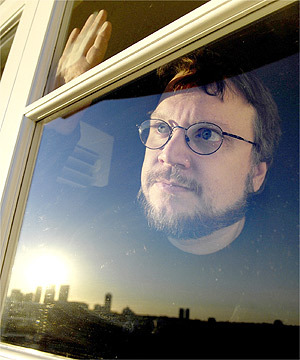 I saw something today in this photo of a creator, peering through the window. The furrows in his brow could mean anything, but I like to think he regrets that he didn’t let Ofelia (and, by extension, his audience) feel the full extent of her mud-smeared, harrowing dream. I’m assuming you’re talking about the moment when Ofelia’s step-dad finds her talking to air, when she’s talking to the faun? I don’t think I agree that moment unequivocally meant Ofelia was in a fantasy, and the Capitan was seeing reality. The ending stayed ambiguous for me, even with that moment. I guess I agree I would have preferred it not happen, not sure what it gives us, unless we’re to see that the Capitan is stunted and dehumanized to such a degree, he can’t see anything past his own reality. I think if the movie truly wants us to think she was fooling herself all along, then there would have been no need to show her in the kingdom being reunited with her royal father and mother. As soon as I saw her blood dripping into the labyrinth, I suspected she was the innocent. Interesting idea of her being the innocent…thanks for that insight. Yes, the two moments that felt like betrayal (to me) were her dying at the end and the Captain not seeing the faun. To me, because she was dying while seeing the kingdom, it felt like a girl’s dying dream, or maybe entree into heaven–not a literal realm where she is the princess. As for the Captain not seeing the faun, I thought it would have been so much better if he’d seen the faun, and maybe rubbed his eyes, or something to indicate that he didn’t believe what he was seeing–that he thought he was hallucinating due to being injured, and drugged… I think a little touch like that would have been more true to the dream of the story. I will certainly want to see this again. I finally saw this movie yesterday. Having read your comment, I was expecting some questions at the end. Interestingly, I did not have a problem with the fact that the captain couldn’t see the faun — I wouldn’t expect him to be able to see it. But since he was initially blocked at getting through the labyrinth in the place where Ofelia had entered, I was surprised that he showed up so easily. I had more problem with the scene before the king and queen in the underworld. Unlike the earlier fantasy scenes, this one struck me as something Ofelia made up — a happily ever after life with mother (wasn’t the queen actually her mother?) and father and baby brother. The faun, who had been very frightening earlier, is suddenly sweet and kind, as if he’d only been testing her. But in the earlier fantasy scenes, she had no control of what happened at all. In truth, despite the fact that the movie has been marketed as fantasy, I’m inclined to think that del Toro really agrees with Ofelia’s mother and Mercedes that fairy tales are childish things, not appropriate for the terrible times in which they live. (Mercedes is much nicer about it, but she has clearly taken the side of reality.) Or, at least, that the fantasy was always meant to be in Ofelia’s head and not real. I thought the movie was really much more focused on the war than on the magic. In response to your comment, “In truth, despite the fact that the movie has been marketed as fantasy, I’m inclined to think that del Toro really agrees with Ofelia’s mother and Mercedes that fairy tales are childish things, not appropriate for the terrible times in which they live,” I think you’re right. I mean, I guess that’s where I was most disappointed in del Toro. To me, terrible times seem even more worthy of fantasy, not as escapism, but as a means to illuminate and feed the imagination. There’s something so crucial about being able to access that part of our collective awareness, especially during times of war. Maybe in a certain way, access to imagination (if imagination is one slice of humanity, and I think it is) could be one antidote to war. Just a thought. On further thought, I’m even more firmly of the opinion that the ending was ambiguous at best, and most likely ‘true’. The fact that the underworld scene happens AFTER Ofelia has breathed her last (judging from Mercedes reaction, and the fact that everyone had moved along to the next issue at hand), and from the fact that it was narrated as had all the magical scenes, by another voice (not Ofelia’s, possibly the faun’s)those two things in combination made me believe we were seeing something other than the wishful thinking of a dying little girl. And as far as the final scene being too sweet and happy, I thought that made perfect sense. She had been facing challenges in the previous scenes, the last one being the decision not to sacrifice her brother for her own happiness. Having passed the trials, the faun no longer was testing her, so he was free to be the loving servant he had always been. I agree though, that the movie was much more about the war than the fantasy elements, which was took me and my friend by surprise when we saw it. The commercials really did seem to be marketing a fantasy movie. For anyone interested in Pan’s Labyrinth, please please please see the beautiful 1973 film from Spain, “El espíritu de la colmena” (“The Spirit of the Beehive”) (For more info go to http://en.wikipedia.org/wiki/The_Spirit_of_the_Beehive). It blew me away. As Lucuis Shepard mentioned on his review of “Pan’s Labyrinth” at http://www.electricstory.com/reviews/review.aspx?title=new/labyrinth, surely Del Toro has seen it, and clearly he was heavily influenced by it. I’d be interested to hear what others think of the Beehive if they see it. My partner was disappointed somewhat in the movie, since his expectations from watching trailers etc set it up as largely fantasy. I liked that it contrasted the real and the fantastic worlds, unlike fantasies that are generally portrayed as wholly seperate from the real world. I took moments of like the captain not seeing the faun and O. spotting the fairy as further blurring of those boundaries. There is a terrific short story by AS Byatt (blanking on the name, it was in her latest collection) that explores some of these themes. 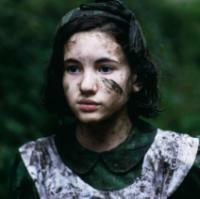 It’s about what happened in a forest during WWII and how the girls involved remember the event. I’ve heard wonderful things about the “Beehive” – I missed it when it was at the Wexner last year. Thanks for the reminder.